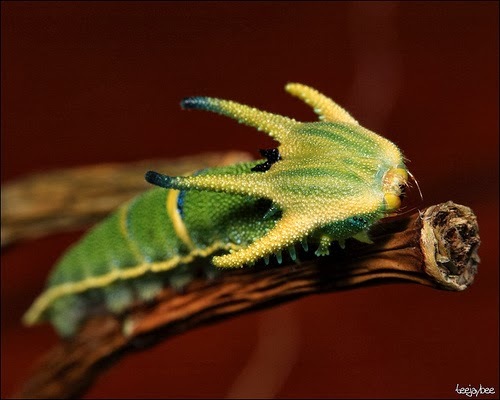 Last week’s alien like Mystery Creature was the Tail Emperor Butterfly caterpillar (Polyura pyrrhus sempronius). Despite its looks it is quite harmless! Found in Eastern Australia this fairly rare caterpillar feeds on the leaves of various species of wattle (Acacia) as well as Poinciana, Illawaera flame tree, lacebark and kurrajong. It weaves a loose white cocoon on the leaves of the plant where it stays when not feeding. As a mature caterpillar it is easy to identify with its four horned head, green body and (usually) two yellows stripes on the third and fifth segments of its body. The caterpillar grows to about 8 cm before pupating into into… the beautiful Tailed Emperor Butterfly! 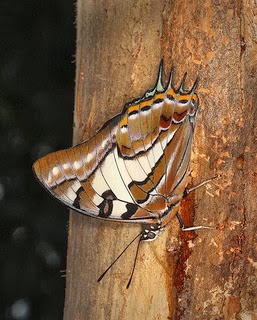 The upper side of the butterflies wings are predominantly white and black.